Interpretations of molecular data by the modern evolution theory are often sharply inconsistent with paleontological results. This is to be expected since the theory is only true for microevolution and yet fossil records are mostly about macroevolution. The maximum genetic diversity (MGD) hypothesis is a more coherent and complete account of evolution that has yet to meet a single contradiction. 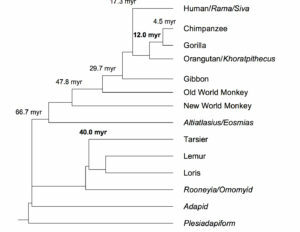 Here, molecular data were analyzed based on the MGD to resolve key questions of primate phylogeny. A new method was developed from a novel result predicted by the MGD: genetic non-equidistance to a simpler taxon only in slow but not in fast evolving sequences given nonequidistance in time. This ‘slow clock’ method showed that humans are genetically more distant to orangutans than African apes are and separated from the pongid clade (containing orangutan and African apes) 17.3 million years ago. Also, tarsiers are genetically closer to lorises than simian primates are, suggesting a tarsier-loris clade to the exclusion of simian primates. The validity and internal coherence of the primate phylogeny here were independently verified. The molecular split time of human and pongid calibrated from the fossil record of gorilla, or the fossil times for the radiation of anthropoids/mammals at the K/T boundary and for the Eutheria-Metatheria split in the Early Cretaceous, were independently confirmed from molecular dating calibrated using the fossil split times of tarsier-loris and two other pairs of mammals (mouse-rat and opossum-kangaroo). This remarkable and unprecedented concordance between molecules and fossils provides the latest confirmation of the inseparable unity of genotype and phenotype and the unmatched value of MGD in a coherent interpretation of life history. This paper by Shi Huang clarifies the origin of the date of 17.6 myr used by Yuan et al. (2017) to calibrate the time of autosomal divergence between the major human continental groups. It provides molecular support to the so-called “Pongid clade” that lumps chimps, gorillas and orangutans together to the exclusion of humans (see below). 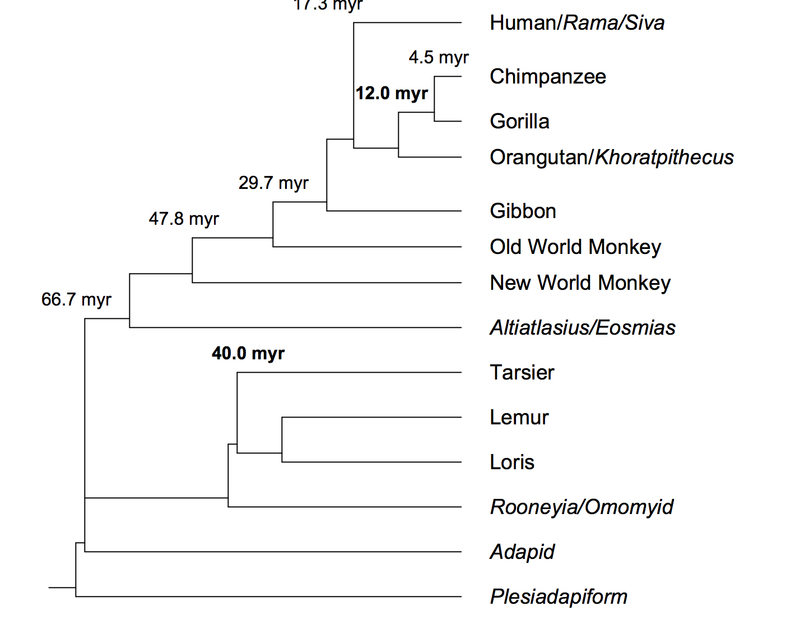 But in Huang’s graph above that used only slow-evolving genetic markers humans broke off from the big apes ~ 17.6 MYA. This obviously extends the phylogenetic depth of the Hominidae (living humans and extinct archaic humans such as Neanderthals, Denisovans, Homo erectus, etc.) lineage to a considerable degree resulting in the calculated divergence between Esen in West Africa and British in the U.K. at 1.96 myr and between Esen and Southern Han at 1.91 myr (see here). One of the advantages of this “long chronology” is that, according to Huang, it places molecular evidence in agreement with fossil evidence (e.g., the divergence of Homo at 2 myr as inferred from fossils closely matches the 1.91-1.96 myr obtained from gene divergence. The issue is very complex and I have no expertise to endorse (or dismiss) Huang’s view. But in one respect his phylogeny is appealing to me. Anthropologists have long argued that if two populations, who are very distant from each other geographically, share unique cultural traits there is a good chance that those similarities are survivals from an ancestral condition that were lost from more centrally and continuously distributed populations. As I have documented on this blog, there’s consistent evidence showing that some key attributes of behavioral humanity (cooperative breeding, pair-bonding, incipient language abilities, etc.) have no parallels among chimps and other great apes. Instead, they show striking similarities to what is being increasingly reported from Platyrrhines, the most divergent (in any phylogeny) and least studied primate order. Although evolutionary convergence can explain this quite well, the evidence is easier to come to terms with if one dismisses the human-chimp node in favor of a Pongid clade. It also opens up a slight possibility to explain those behavioral parallels between species at the extremes of a primate phylogeny as convergent retention of ancestral traits (going back to the primary split between Platyrrhini and Catarrhyni some 60-50MYA), not de novo adaptational convergence.